ChainLink Research : Research :Is SAP Still On? "On-premise, on-demand and on-device," said Bill McDermott, SAP's new co-CEO. 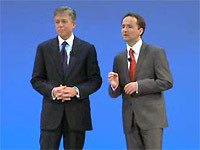 But with the recent rebellion by their customer base against SAP's cost increases, as well as significant revenue and corporate culture challenges, can the CEO duo of Snabe and McDermott turn the company on to new directions and better performance? "We are on-premise, on-demand and on-device," says Bill McDermott, "and we can orchestrate like no other," when prompted by Joe Kernan of CNBC's Squawk Box. Joe asked if they had the time to execute the new plan and not be acquired. A fair question, considering SAP's 4th quarter results and the subsequent changes and downsizing of the company. Of note, rival Oracle seems to have reconciled their various approaches to platforms: on-premise vs. on-demand, as well as a successful hosting service - making several profitable business lines. So, it can be done, but as we have said, this is a major commitment. Becoming more entrepreneurial will also be a huge challenge for the massive, Waldorf-headquarters-centric company. Efficiency always helps, but obviously price hikes will be used to gain better margins in the future. Bill McDermott spun the customer support cost increase scheduled by calling it "elegant and complete," creating a two tier model. One is at higher cost - elegant - i.e. the Enterprise, coming at a whopping 22% over time. Even the everyman's services, the so-called Standard, will be 18%, which is above industry benchmarks of around 16%. This does not bode well for the TCO metric used by many CIOs and customers to gauge part of the value proposition. However, SAP's COI (Cost of Integration) is much better than rival Oracle: that still has challenges with its FUSION roll-out and the confusion associated with their competing products. How to get around these staggering support costs? Don't buy software that you don't need. User requirements are still loaded with we might needs. Research shows that most people never get around to using those. CNBC staff had a few humorous statements about the co-leadership announcement of last month. But in fairness to SAP, they have done very well in collaborative-type leadership models since the inception of the company, creating their market leadership in enterprise software. When people make negative statements to us on SAP's future, I often repeat the Mark Twain quote: "The reports of my death are greatly exaggerated." In spite of the bad press and the changes in performance on revenues and share price over the last few years, most financial analysts are positive on SAP's prospects.